Woolworth was quick to spot the sales potential of pre-recorded videos and was able to corner the market. The initial range of golden oldies from the silver screen, which were marketed as "A video for the price of a blank tape" proved a huge hit. Working with the suppliers and sister company Record Merchandisers (later Entertainment UK), the Buyer showed great skill in developing the market, broadening the range to include something for everyone. Throughout the late 1980s and 1990s the videos were the lynch pin of Operation Focus, generating sufficient sales and profit to replace more than 10,000 of the lines that it had eliminated. In the late 1990s Kingfisher acquired the principal supplier, which by then had morphed into 'Video Collection International' or VCI. It was among the companies demerged as part of Woolworths Group plc in 2001, and later launched a lucrative joint venture with BBC Worldwide, as 2|Entertain. It was sold at a knock-down price to the BBC when Woolworths Group collapsed into Administration, and still prospers today. 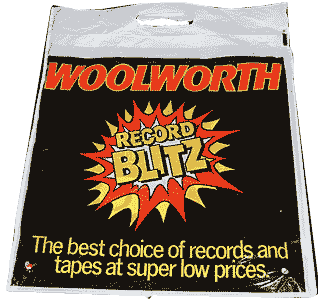 In October 1980 F. W. Woolworth launched a ground-breaking new promotion called "Record Blitz". Every store began to offer the top twenty chart albums and seven inch (17.5cm) vinyl singles at 50p or more below the recommended price. They also sold selected back catalogue titles with larger discounts. At the time this was a radical move which broke with tradition. It set the chain apart from other retailers. Woolworth and its wholesale supplier, Record Merchandisers, had persuaded the major record labels to approve and partly fund the promotion. It was expected to generate a major uplift in sales. 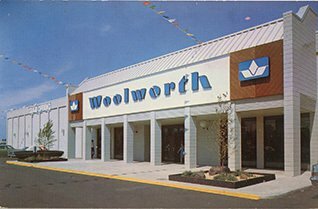 The marketing strategy proved highly effective, catapaulting Woolworth from the sidelines to market leadership for singles overnight. It also boosted its sales of albums. The discounts were popular with customers of all ages, attracting teenagers back to the stores in large numbers. When Paternoster took control in 1982, it inherited a music department that was growing rapidly, despite a dowdy environment and a limited product range. The new owners continued the chart discounts while also trying to build sales of back catalogue titles, which attracted higher margins. They also looked for ways to diversify into new product ranges, and upgraded and modernised the store look. In the USA Woolworth had sold 8mm movies from the late 1960s onwards, and had started to sell pre-recorded videos in the mid 1970s. But in the UK, where most video and television equipment was rented, the sell-through market was reserved for the very rich. Most pre-recorded Betamax and VHS titles were prohibitively expensive at around £30 per tape. Instead a network of video rental shops had emerged in Britain. These hired out tapes for around £1.50 per night. 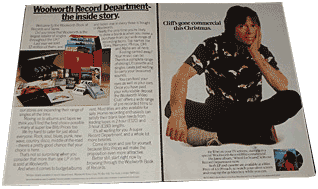 Then, in 1985, K-Tel approached the Woolworth Entertainment Buyer Paddy Toomey, offering a range of pre-recorded videos to be sold at budget prices. Toomey saw the potential and negotiated for an exclusive launch. He also persuaded the supplier to fund of four foot wide (122cm) purpose-built display stand. The range was branded 'The Video Collection'. It was promoted as 'a video for the price of a blank tape', with few airs and graces about the original titles. Woolies customers were advised that every cassette used 'high quality tape', meaning that once they have finished with a film they could tape it over, and have the benefit a much better index box than the standard cardboard wrapper. At the time blank tapes were five times more expensive than they were in the 2000s. Toomey's decision to sign and exclusive deal and cram the stores with stock was criticised by some Executives as a gamble. Doubts soon turned to excitement as stores started to report a virtual sell-out of their initial deliveries of the films. Frenzied activity followed as there were insufficient duplication facilities in the UK to produce videos fast enough to meet customer demand. Within days, German suppliers were found to make more, but demand still outstripped supply. Toomey's Buying Team and the Supplier were imaginative in developing the range. They added new titles and genres of film. This helped to maintain customer interest. Clever marketing helped to sell the concept of buying videos to a wide spectrum of potential shoppers. Kids Cartoons proved particulularly popular, as were Sports Videos and Keep Fit titles. The success of the K-Tel offer attracted new entrants to the market. Woolworth added titles from Pickwick and Channel Five, as other retailers also joined the bandwagon. But, proving that fortune favours the brave, Woolworth retained the first-mover advantage and grew an enviable market share of over 30%. A few titles enjoyed phenomenal success unexpectedly. Highlights of children's television classics like 'Watch with Mother' and 'Bill and Ben' captured the imaginations of a generation of parents who were keen to give their children a glimpse of their own childhoods. 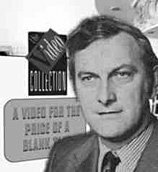 The titles became top sellers for Pickwick Video and gave an early indication of the potential value of the BBC's vast library of material. 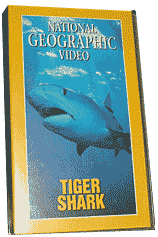 Natural world videos also became family favourites. National Geographic published a wide array of titles, featuring many subjects from the Life of Whales to the History of Steam Trains. Each had been beautifully shot and elegantly edited in vivid colour. The Woolworth Buyer Paddy Toomey later distinguished himself at the helm of one of the leading publishers. Meanwhile K-Tel spun off The Video Collection as Prestwich Holdings Ltd. It later became Video Collection International, and then VCI Group PLC. It was acquired by the Kingfisher Group in 1999 and demerged with Woolworths in 2001. For a time, a joint venture, 2|Entrertain, forged between VCI and the BBC, was exceptionally lucrative, until the market went into steep decline. If you have a Broadband connection and would like to see the original Video Collection trailer, please click here. Acquisition of B&Q by F.W. Woolworth & Co. Ltd.